Set in France in 1682, Kate Winslet plays a talented landscape designer, who is tasked with building a garden at Versailles for King Louis XIV. Struggling to overcome a great loss in her life, Winslet’s Sabine is closed off to the ideas of chaos in the world, even as those around the king believe that inviting a woman of low birth into the gardens is madness and destined for disaster. Sabine is given the royal assignment by the handsome Andre Le Notre, played by Matthias Schoenaerts, a man who is trapped in a thankless marriage to a woman who believes he is beneath her. Sabine is thrust into the midst of the court of the king but jealousy threatens her standing, her ability to complete the garden, and a burgeoning romance with Andre. Despite playing the king, Alan Rickman directs but does not step in front of the camera quite as much as you would expect, instead letting Winslet and Schoenaerts take centre stage in this period romance. It’s a shame as the love story barely simmers while Winslet and Rickman’s few scenes together actually start to sizzle with something a little more exciting. The romance feels as though it has been played out a thousand times before and the less said about Sabine’s tragic back story, the better. 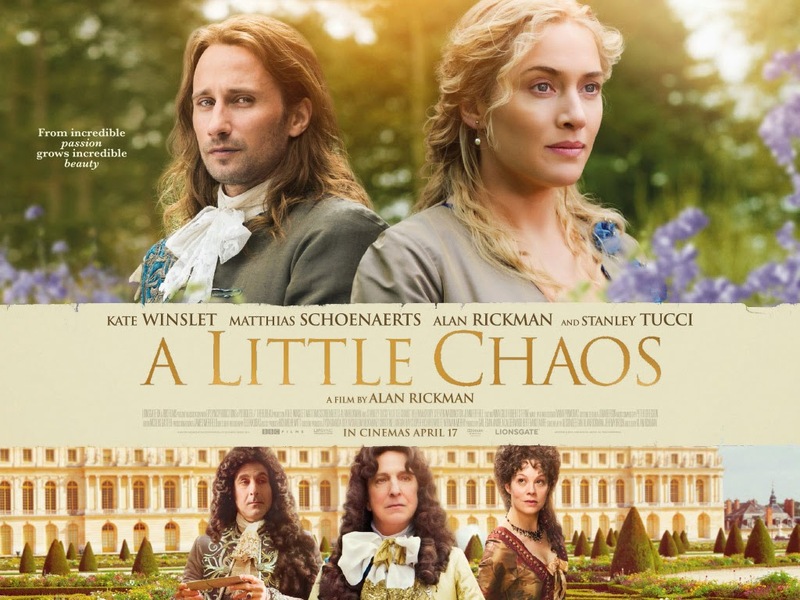 However, A Little Chaos comes to life, particularly towards the end in a pair of scenes, one delivering some heart warming female bonding and the other offering a rousing climax. In amongst all this though, is a lot of talk of gardening. There is little danger and far too little conflict. Winslet seems subdued, leaving it up to Stanley Tucci to steal his too-few scenes and Rickman to swan in and save the film from becoming utterly boring. It’s a stately, occasionally quite beautiful film but unless you are a fan of gardening or mostly chaste romances, you will yearn for something more. Overall, A Little Chaos could have done with a lot more conflict, danger, excitement and yes... chaos.